My name is Calvin Gladney and I’m the (relatively new) President & CEO of Smart Growth America. I’m excited to build on the long legacy of my predecessors Geoff Anderson and Don Chen. But who am I? Here are three things you should know about me that shaped my work over the last decade. I’ve sat in all the seats: I’ve worked in the public, private, and non-profit sectors. I’ve been around the block: I’ve worked in over 25 cities in the last 10 years alone—often right along with teams from Smart Growth America. I’ve talked about it and been about it: I’ve helped build buildings, plan neighborhoods, and pass legislation. This holiday season, we’re thankful for all of those who have supported SGA’s work over the last decade. And I’m hoping I can count on you as we look ahead to a bright future in 2019. Why support Smart Growth America? For the same reason that I want to work here: SGA is the only national organization working to ensure that no matter who you are or where you live, you can enjoy living in a place that is healthy, prosperous, and resilient. And we’re making this happen through incredible work at the national level and in communities of all sizes across the country. We worked all over the country with partners like you to help cities make their streets safer for everyone. 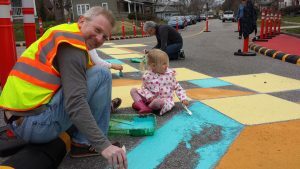 In South Bend, IN, residents and city staff painted a temporary design in the street as part of a demonstration project to test safety improvements. Americans want to walk and bike more. But as long as we continue designing our streets to prioritize moving cars—not people—as quickly as possible, those walking will continue to be killed in larger numbers. How is SGA changing this? This year, our National Complete Streets Coalition launched the Safe Streets Academy. Over the course of several months, our experts worked with three cities to build skills in safer street design and then helped them put these skills into practice with real demonstration projects that transformed their streets, intersections, and neighborhoods into slower, safer places for people—proving the value of safer streets. We are repeating this work with three more cities in 2019, but we’d love to expand it to even more places. Supporting SGA means supporting safer streets. Our Transportation for America program is putting intense public pressure on the Federal Transit Administration for failing to award capital grants to building and expanding public transit. The Trump administration has declared war on transit funding. Twice now, they’ve asked Congress to end the program that cities use to build or expand transit. Twice now, Congress has refused and given USDOT more than $2.3 billion to advance these transit projects. Yet USDOT has awarded less than a quarter of those funds. Our national advocacy and media work is shining the spotlight on USDOT’s intransigence, forcing FTA Administrator Jane Williams to respond publicly after regular questions from members of Congress and major newspaper editorial boards saying “show us the money!” We’ll need your help to continue this drumbeat as the Trump administration continues their hostility toward transit, something that communities of all sizes are clamoring for more of to help attract talent, stay competitive, and keep everyone moving. Supporting SGA means supporting improved public transit. We are on track to provide tangible help to dozens of communities of nearly all sizes in 2019. We commissioned artist Noah MacMillan to envision our work and create a mural for our office. You can get a free print of this beautiful artwork on a poster with a $50 donation to SGA. After working with four different communities last year to help them use small-scale manufacturing to help build successful and vibrant downtowns, we’re well underway doing the same with six new communities in 2019. We’re also in the midst of helping three communities learn how arts & culture can help them produce better transportation projects that are more beloved by their residents, and just last week we launched a new statewide artist-in-residence program for the Washington State DOT. We believe deeply that arts and culture are essential for empowering our communities to thrive, but we want to do more. Supporting SGA means supporting the culturally rich places that you call home. Smart Growth America soldiers on because we know that our work is critical. 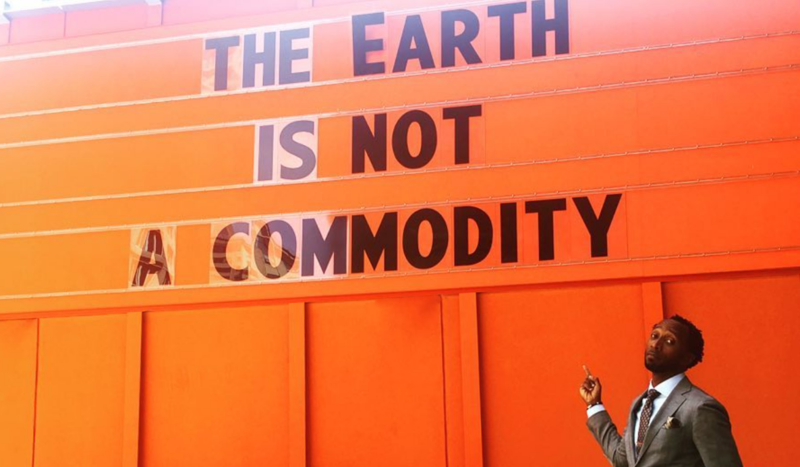 If we do nothing, the majority of metro areas in the U.S. will continue struggling to address deep inequities in housing and transportation costs, new transportation technologies like automated vehicles will lead to increased congestion or streets that are more dangerous, and climate change will lead to large swaths of the neighborhoods we call home becoming uninhabitable. But through our unparalleled thought leadership, technical assistance, and advocacy, Smart Growth America is committed to working at all levels of government to address these challenges. We’ve proven our worth every day of 2018 with real on-the-ground action. Let’s do more together in 2019. Make your tax-deductible donation today.